When I first heard about the concept of spending five whole frigging weeks in one balloon, I thought it had a high potential for turning quite tedious after the initial rush of being able to drop coins and spit on people on the ground inevitably wore off early the first afternoon you were airborne. Of course all that potential was fulfilled (and then some) once those five weeks in a balloon proved to include future Branson, Missouri headliner Fabian performing the film’s odious theme song on a concertina during a pitstop at a desert oasis in a sequence that Jules Verne only wished he was imaginative enough to concoct! It wouldn’t be fair though to lay much, if any, of the blame on the awesome hair of Fabian for the film’s propensity to float aimlessly and provoke the nausea that such a real life balloon trip would surely entail. Yes, the film saddled him with the role of the crabby professor’s assistant, Jacques, who was pointlessly Canadian, but little was demanded of him beyond putting wood in the balloon’s furnace and pulling a lever up and down. The guy who had the audience constantly wishing that Fabian would pull that lever in the wrong direction was Red Buttons as the scandal-plagued reporter Donald O’Shay. O’Shay spends the rest of the film simultaneously attempting to be the comic relief and the hero and not succeeding too well in either category, coming off as merely obnoxious and making you feel bad for the classy Barbara Eden having to be anywhere near this moron. O’Shay, Jacques, the professor, and stereotypical elderly British soldier more concerned with his precious teapot than anything else are aboard the balloon in an effort to beat a bunch of slave traders to western part of Africa. If they can get there first and plant the British flag, this will allow Britain to claim the area and somehow all the slave trading will cease. As is to be expected, much of the film is made up of our heroes worrying about whether they are ahead or behind the slavers and whether they can make up a bunch of time after various disasters befall them. Needless to say, once you find out toward the end of the film that they haven’t even been flying during the night, you begin to question the true urgency of their mission. The reason for the trip though isn’t really the point of these sorts of movies. It’s the crazy adventures that happen along the way that really matter. With five weeks floating across uncharted lands, surely there are all sorts of amazing, hair-raising, and fantastical civilizations, creatures, and treasures to be had, right? Sure, if you think Peter Lorre and a wacky chimp qualify. For anything else though, you’d have to watch another movie. Lorre as a captured slaver is largely wasted though he has about two funny lines (which is two more than anyone else), but it is the chimp who is the sole reason to watch. She drinks wine, carries a rifle and walks guard duty, lathers up her face as if to shave and sports a monocle at one point! During one battle scene, she was even waving a rolling pin around prompting both chuckles and wonderment that a balloon expedition across uncharted Africa would pack a rolling pin! Nothing much else of any interest transpires on this hot air trip. 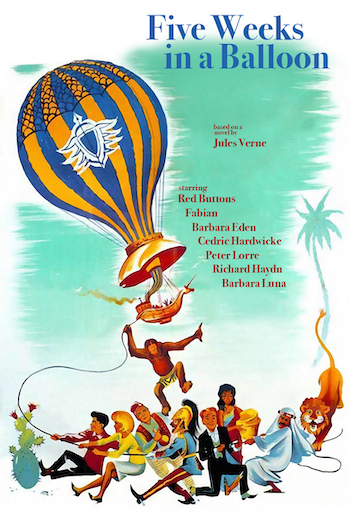 There’s escapes from angry natives of various stripes including one where Eden’s character Susan is rescued from slavers (not to be confused with Makia who was rescued at the beginning of the film and stowed away on the balloon), O’Shay and Jacques have to rescue everyone from imprisonment in Timbuktu, there’s an incident where O’Shay is chased by a lion, and a final crisis where everyone ends up at risk of being swept down a raging river. It’s all very repetitive, but even worse, what’s repetitive was dull to begin with. Lacking any of the excitement of other Verne adaptations such as Mysterious Island, 20,000 Leagues Under the Sea, and Journey to the Center of the Earth, the film does feature sporadically passable special effects during some of the balloon action, though there are also several times where it is painfully clear a model is being used and characters are only reacting to stock footage of wild animals. It should also be noted that while the balloon itself is a very stylish red and white striped affair, the gondola is an ugly thing dominated by a large unicorn head at the front of it, like it was some sort of fey viking air ship. Director Irwin Allen rightfully began earning his nickname “Master of Disaster” with Five Weeks in a Balloon.